This article presents to you Top 12 amazing ideas of polka dot crafts and how you can make them. The polka dot pattern is something that can never go out of fashion regardless of time and fashion eras. They always look cool and fashionable yet simple and stylish on different objects as well as on clothes. The main thing is to learn the method and technique of how to do them. The first idea here is making polka dot pattern on empty tin or copper boxes with help of chart sheets or papers and markers. These pretty boxes can be used to keep different items or crafting materials. This pattern can also be made on ceramic crockery ,as you can see in the picture that how polka dots can be made on ceramic chickens to make them look more impressive on your dining tables and the idea is unique as well. Our plain colored umbrellas can also be beautified with the polka dot designs as shown in the picture. These umbrellas look so amazing and exciting. This pattern looks equally amazing on glassware such as on wine glasses and lemonade jugs etc for your cocktail parties or evening open air snack parties. One of the favorite crafting techniques is doing this pattern on fabric bags which can be used a gift bags or goody bags. This pattern when drawn on jars either of glass or any other material looks so amazing that you will fall in love with it. You can also decorate your DIY coffee mugs with this polka dot design. We have also shown pictures where we have done the pattern on fruit stands to enhance their beauty. 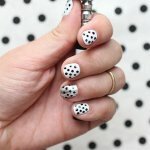 Girls are these days in love with the polka dot nail art designing. This can be done with two different colors ,one is used for the base and the other can be used to make polka dots over the base with help of either a nail art tool or toothpick or any other prop. We can also make cardboard things and cover them up with polka dot design sheets. These cardboard structures can be used for keeping different materials. You can do this polka dot pattern depending on your own choice, you can play with different colors, make different objects, transform your old clothes, accessories, containers, boxes and other stuff with this simple technique.